Author Dean Wesley Smith has, through his videos and a few emails we've exchanged, taught me a fair amount about writing fiction. You must refrain from rewriting, except to editorial order, and (Harlan Ellison's Corollary) only if you agree with the change. You must repeat the rules above. A couple of years ago, Dean started doing something he calls "Writing in Public" where each day he posts a description of what he did for the day, his thoughts on writing from the day, and finally his monthly totals for writing novels, other fiction, blog posts, and email. He also posts the number of hours he spent on work, exercise, television and napping, and writing. I'll borrow some from Dean's format, but add some of my own ideas. 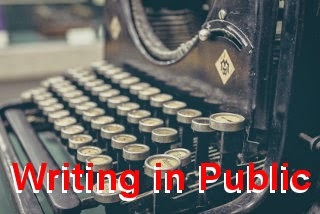 I also plan to share in each post after this one some information about what I've learned about writing that day, to perhaps help you if your goal is to become published one day. I may also share sentences, paragraphs, or scenes that I'm happy with or want feedback on. If you know me personally, commenting on these posts when you're with me will be a big help. Letting me know you're paying attention will help keep me motivated. Asking me questions about what I'm working on will be of benefit, too. Talking about the things I'm working on often helps me find new ideas, refine the ideas I have, and keep motivated about doing the work. If you don't know me, but find the posts helpful, interesting, or informative, submitting comments would help, too. Just be aware that comments don't go live until I approve them. That's not because I don't want to hear from readers, but because there are way too many comment spammers out there. I don't want you to have to sift through their crap, so I don't let any comment go up until I know it's on-topic. I'll end this post with a report on November 2014 activity. At a very high level, I worked on a novel for National Novel Writing Month (NaNoWriMo) called "Fully Invested" about a video game AI that is charged with managing its creator's investments and finds itself exposed to malware, Russian cyber criminals, a partially rewritten copy of itself, and the NSA. I also did several posts for my beer blog.